The Njeanius blog: War Poets 6: Who reads the peace poets? War Poets 6: Who reads the peace poets? They're exciting and never a bore. There''s glory and horror and gore. Where are the peace poets? You won't find their books on our shelf. We've experienced that for our self. The pity the horror, the gore. While we wait for another war. Well I've written it the peace poets poem that has been going around my head for a long time. Not aas good as it looked in my mind but not bad I think. At least it is short. It is too easy to run on and on when not bound by some set form like the sonnet. As you can see from the earlier posts I'm a bit doubtful about the influence of the war poets. It is so hard to mourn the horrors of war without in some way glorying in it. War poetry seems to me to verge on the edge of pornographic violence. I suppose this is part of the old argument between Plato and Aristotle. In brief the argument goes. Plato "Watching all these plays about people killing each other just encourages people to do it." Aristotle "No no, it enables us to feel the horror without actually really doing it - it purges the mind/" The argument is pretty much that, though put at greater length (try here to learn more.) . And the answer is really we don't know whether it is good or bad, or maybe we don't care. People are going to watch violence and read about violence whether it's bad for them or not. Perhaps it also throws light on the difference between Owen and Sassoon. The last two posts on this blog have been readings by my friend Nigel Pascoe of poems by this pair of World War I poets. Sassoon's "The General" distances itself from the horrors. Owen's "Dulce et Decorum Est" dives straight in and immediately involves the reader in the emotion and the horror. Those, like myself and my father, who prefer Sassoon to Owen are perhaps fearful that being too close to the emotion is too much like glorying in it. Hard to say who is right. Hard to remember the dead of the wars in a way that seems honest and right. I mention my father because I have just published his books on World War I as ebooks. He fought on the front from 2015 and was wounded several times. There are three of these books, an autobiographical novel, a true autobiography, written many years later, and a life of Siegfried Sassoon which of course mentions Owen (Sassoon and Owen met in a shell-shock hospital and Sassoon encouraged and influenced Owen.) 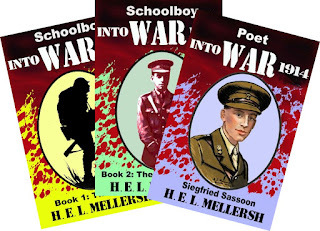 You can read about my father's books here on the njeanius website and there is plenty on the web about the meeting of Sassoon and Owen. You could start here. There's a lot more I would like to write more generally about poetry and what it is for. Also I have found on Google (thanks be to Google) the parody of "Scorn not the Sonnet" about keeping poems short. I hope to cover it in my n ext when I will leave war poetry for a bit.